If your team has grown to the point where your brokerage isn’t contributing to your success, you may be thinking about striking out on your own. The risks and uncertainties involved with starting your own brokerage may keep you from taking the leap. But leaving your brokerage behind may open up significant opportunities for professional growth and financial gain. In this blog post, we’ll be reviewing the different types of brokerage models to help you decide what might work best for you to serve your customers and ensure success for years down the road. In a traditional brokerage model, agents typically leave their current brokerage and start a new one. The business owner or lead agent takes on the responsibilities associated with leading a business in addition to their duties as an agent. Your brokerage can specialize in a type of real estate, such as new construction or luxury homes. As you grow and develop your team, you’ll receive a portion of the sales closed by each agent that works under your brokerage. Owning your own brokerage will allow you to implement new ideas and deliver results to your clients under your vision. There are great rewards and great risks in starting a brokerage. You assume the amount of work and the cost required to manage a business. Even the most successful, hard-working agents can underestimate the commitment needed to open their own traditional brokerage. But you will be free from the bureaucracy of the “big box” brokerage, and have the ability to adapt and make changes more quickly based on the climate of the industry and your particular market. You also have the option of buying and running a franchise of another brokerage. As the owner of a franchised brokerage, you will represent a well-known brand, have a built-in support system and work within the system of the larger organization. There will still be rules you’ll need to follow and requirements to meet. You’ll need to pay for training, support and other resources for your office and for your agents. You’ll need to pay ongoing percentages of revenue — likely 5 percent of your gross revenue — for sharing in the brand. To determine if buying a franchise is right for you, you’ll need to consider the market share of the brand, the required fees and the potential for sales. 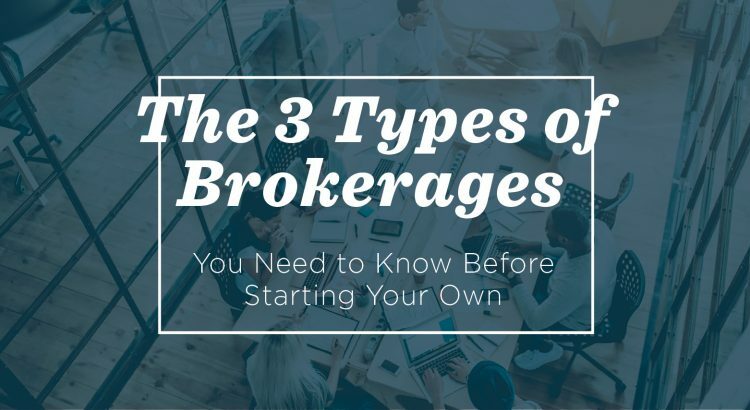 Just like starting a traditional brokerage, you’ll need to be prepared to handle the day-to-day operations: business planning, acquiring and training on new technology, and hiring additional agents to grow your team. According to Entrepreneur magazine, franchises are more likely to succeed than independent startups. There is much less risk involved in owning a business that has already been established and is well known in the industry. New, nontraditional brokerage models emphasize small teams and partnerships that share resources to maximize efficiency. Nontraditional brokerages may share work spaces, administrative staff and office equipment to save money and maintain profits. Within the team-based model, specialists are designed to handle specific duties within the team. Each team member focuses on a particular specialty and communicates with the rest of the group based on this role. Each sale is integrated within the team. New models in any industry often take time to adapt and change to best fit the climate of the market. A nontraditional model may work for you, but you’ll have to consider the management style that will work best for your agents. Once you’ve achieved administrative planning and success, the team-based on model may bring unmet client service standards to your customers. A nontraditional model gives you the opportunity for greater reach for marketing, networking, lead generation and sales [How?]. The strength of this model lies in your team being able to drive referrals based on excellent customer service. The focus is always on retaining and growing current agents within their specialty, and ensuring collaboration within the overall team. No matter what you decide, owning and running your own business can be both challenging and rewarding. Those who are up to the challenge are usually in for an interesting path to success. To chart your own path to success in 2019, download your free business plan template and start your free 7-day trial of AgentEDU.